Several Soviet self-propelled guns were built in competition with the Joseph Stalin IS tank series. 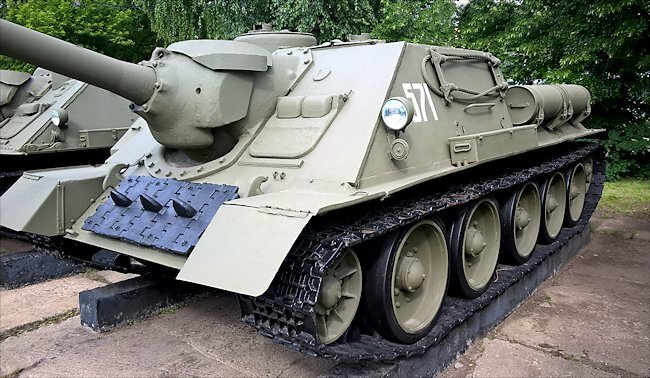 In August 1943 engineers Machonin, Gorlick and Trojanov designed the new SU-85 tank destroyer. 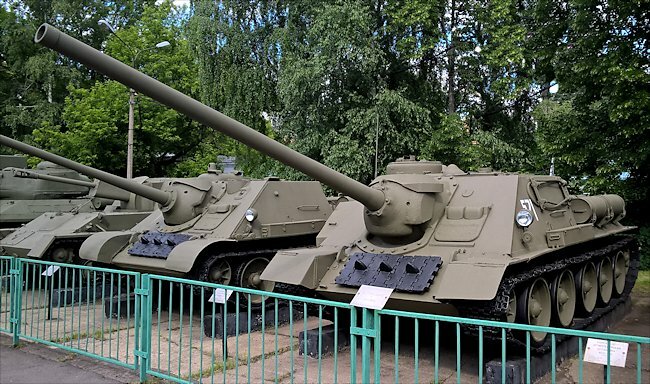 Towards the end of 1943 the Uralmashzavod and Chelyabinsk combines built 100 SU-85s, but during the following year a significant increase in the production of this vehicle took place. The SU-85 gained respect during the fighting with German tanks in the Ukraine and Dniepner offensives of 1944. It took over the tank-destroyer role from the SU-76, which now became relegated to providing artillery fire support to infantry units. The SU-85 closely resembled the older SU-122 in hull configuration, with the gun mounted in a fixed superstructure on the T-34 tank chassis. The gun was a tank adaptation of the 85 mm anti-aircraft gun M-1939. 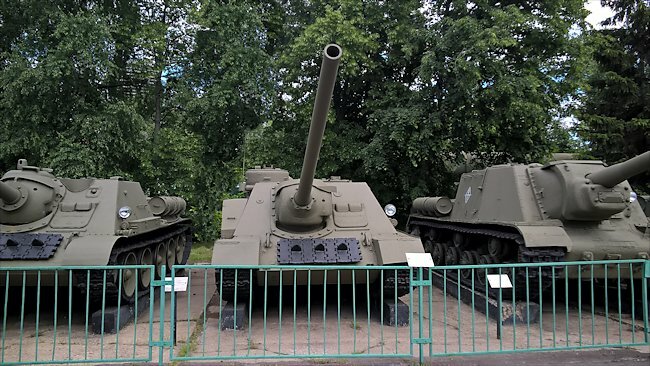 With the introduction in 1944 of the T-34/85 tank, the SU-85 became obsolescent and was reworked with the 85 mm gun D5-S85A (M-1944) anti-tank gun and issued to satellite armies. There was no visible difference between the two guns, although the M-1944 had a greater range and greater armour penetration. 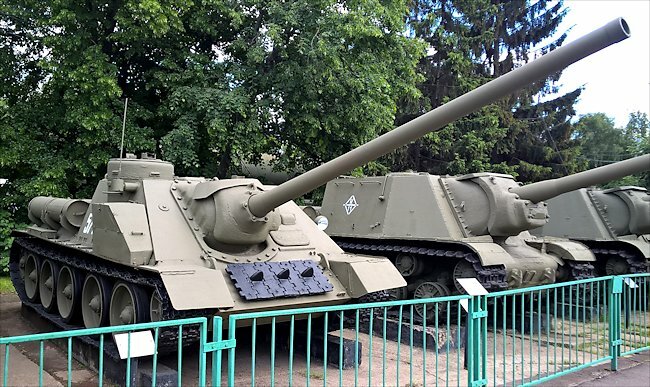 This WW2 SU-100 Tank Destroyer is in the missle between a SU-85 on the left and an SU-152 on the right. The superstructure was very similar to that of the SU-85 and the hull, running-gear and automotive components were identical to the T-34/85 tank. The armament consisted of the 100 mm field/anti-tank gun Model 1944 (D-IOS). As with the SU-85, no secondary armament was carried. The 100 mm gun had a greatly improved performance over that of the 85 mm gun, firing a high explosive HE shell to a range of 21 ,000 yards. It also fired an armour piercing AP round. The SU-100 normally carried, on each side towards the rear, two extra fuel tanks. A single headlamp was mounted on the left over the track for night driving. Spare track links were often bolted on the front, together with a long wire towing cable. In action, the rear of the chassis behind the crew compartment was usually piled with wooden ammunition boxes, and stowage. The short whip aerial could be folded to the rear along the side.